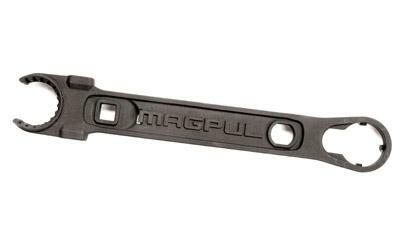 The Magpul Armorers Wrench is made of solid steel construction with grip-enhancing phosphate finish engages both stock and pin-style barrel nuts. Fits standard sized flash hiders. Installs and removes rifle receiver extensions and carbine castle nuts, with extended teeth for use with ASAP plates. Two hammer faces. Works with 1/2" torque wrench, relevant torque specifications included on Wrench for quick reference. Convenient Bottle Opener for refreshments after the build is complete (fits both Metric and SAE bottle caps.) Made in the USA.